Ohio School Report Cards give your community a clear picture of the progress of your district and schools in raising achievement and preparing students for the future. The information measures district and school performance in the areas most critical to success in learning. 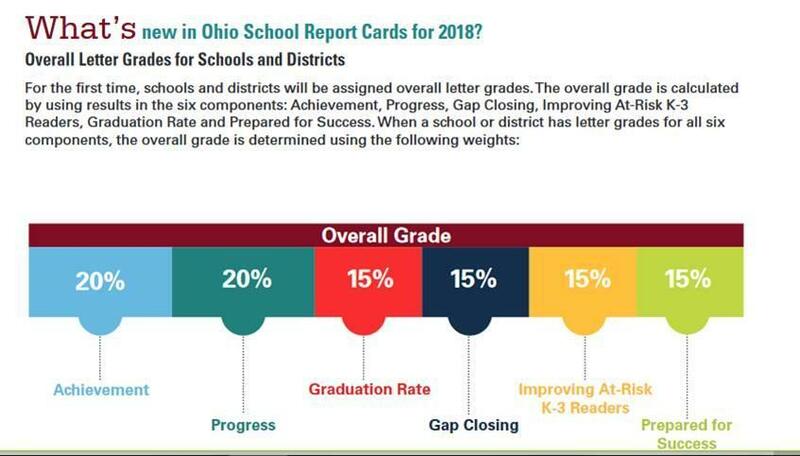 Ohio School Report Cards data shows educators, school administrators, and families where their schools are succeeding as well as areas where they need to improve. Schools and districts report information for the Ohio School Report Cards on specific marks of performance - called measures - within six broad categories or components. The components are Achievement, Progress, Gap Closing, Graduation Rate, Improving At-Risk K-3 Readers and Prepared for Success. The Department gives letter grades on each of the six components and most of the individual measures. This will help give Ohio parents and schools an even more complete snapshot of the quality of education they are providing their children.